HARLEM — An urban farm in the heart of Harlem is hoping to feed its neighbors' stomachs as well as their wallets this summer by using a greenhouse to employ local mothers to grow lettuce for public school students and local restaurants. Harlem Grown, an organization that flips vacant city lots into small farm spaces, plans to use its hothouse overlooking P.S. 175 Henry H. Garnet School of Success at West 134th Street near Lenox Avenue to create a job-training program for unemployed mothers who have children that attend the school. “Hopefully, it will work as a job-training program for parents at the school and local residents,” said Kelly Gillen, a program coordinator for Harlem Grown, who said she hopes the program will begin in the next few weeks. “We want to be harvesting every week, so the mothers will be doing it on a rotation basis and eventually it's what they will harvest." Harlem Grown planted its first seedlings for microgreens in its new greenhouse on Friday, which it will harvest and sell to local restaurants. A high number of students at P.S. 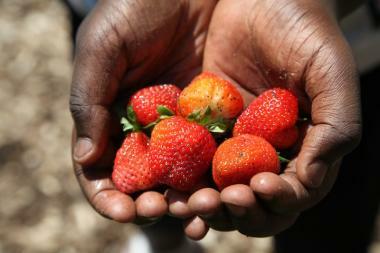 175 are raised by single mothers and many of these parents are unemployed, said Tony Hillery, founder of Harlem Grown. The Harlem farm plans to employ four single, out-of-work mothers with children at neighboring P.S. 175 as paid trainees to plant and harvest the heads of lettuce grown in its greenhouse, he said. "If we earn money from selling the lettuce, then we can support the mothers' training program,” Gillen told DNAinfo New York recently, while working on vegetable beds. The Harlem farm began with an abandoned city lot, overrun with rodents and trash — but soon flourished into three vibrant spaces: two plots at West 134th Street and one at West 131st Street. The city's Parks Department owns the three plots that Harlem Grown operates. The urban farm plans to sell two-thirds of its lettuce, grown in the hydroponic greenhouse, to restaurants in the city, while saving the remaining third for the community. “We're starting with 3,000 baby lettuce plants," Gillen said. “Last year we produced 800 pounds [of produce],” she added. “This year, we’re planning on one ton." Lettuce is known for growing quickly and works well with hydroponics, producing a harvest every three to four weeks even during the winter months, she said. 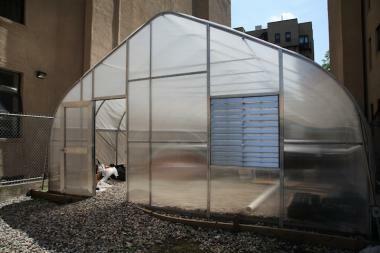 One Harlem restaurant has already signed up to purchase its leafy greens from the 134th Street greenhouse. “We hope to have a shipment in the next couple weeks, but it's all so dependent on the weather since it's a really sustainable project," said executive chef Jonathan Romans of Corner Social at 321 Lenox Ave.
Romans plans to use the mixed greens for the restaurant's salads, burgers and as a decorative garnish for entrée platters. 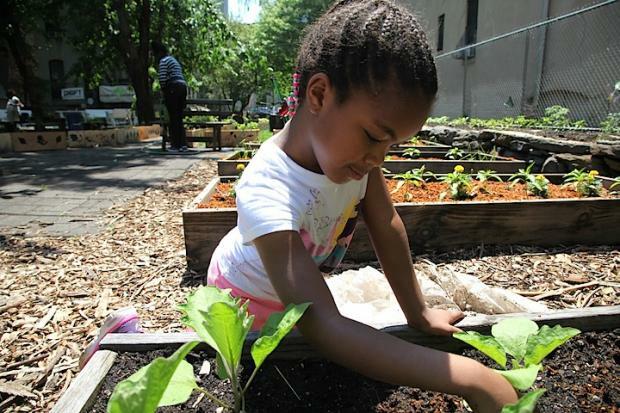 South Harlem resident Fafiya Raheem, 34, who volunteers at the garden every other Saturday with her 5-year-old niece Kimora Silva, said a mothers' training program in the community is needed. "The neighborhood definitely has need for economic development and if it can come in this way to raise sustainable agriculture, then that's phenomenal,” Raheem said. Organizers said the selected four trainees for the greenhouse job program will all be single, unemployed mothers with children at P.S. 175 who have all volunteered at the garden. Harlem Grown plans to pay the mothers in its job-training program above minimum wage, organizers said. “A living wage is $14 or $15 and we don't know what the fair market value is for urban farming in New York City,” Hillery said. The median hourly wage for an agricultural worker is $9.12, according to the U.S. Department of Labor Statistics. Hillery plans to install a solar panel on the roof of the building adjacent to the greenhouse before the winter to reduce the hothouse's energy cost and share the source of sustainable energy with the building. The community garden will increase its production with the greenhouse to grow mixed salad greens year-round, they said. “We’re really trying to amp the food that’s available, and for there to be a place in the neighborhood to get it," Gillen said.